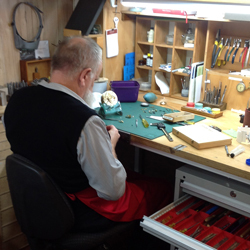 The team of specialists at Canterbury Clocks and Watches bring a wealth of experience and passion to their craft and are firmly committed to quality work. You can be assured that your timepiece will be treated like it is one of our own and we stand behind our work with Melbourne’s most comprehensive warranty on all repairs completed by us. 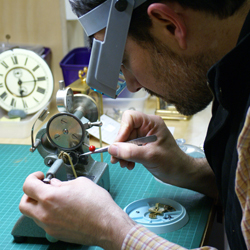 Douglas has an Honours Degree in Engineering (Melbourne University) and over 20 years experience in clockmaking. He joined Canterbury Clocks in 1999 and took over ownership in 2007. Douglas’s passion for precision engineering has seen Canterbury Clocks and Watches become one of the best-equipped horological workshops in Australia. His expertise has attracted clients from across Australia and, under his mentorship, Canterbury Clocks and Watches has developed a reputation for being able to complete repairs and undertake work often avoided by other repairers. David brings 40 years experience to Canterbury Clocks and Watches and there isn’t much that he hasn’t seen during his career. 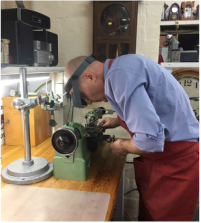 Completing his clock and watchmaking apprenticeship through RMIT, David has worked for a number of different retail establishments repairing and restoring clocks and watches before joining us in 2009. David is the person to see for watch repairs and battery changes. Shaun has a PhD from the University of Sydney and after spending a number of years in academia, has realised a life-long dream to pursue a career in clockmaking. Shaun brings to Canterbury Clocks and Watches a passion for the trade and an enthusiasm for developing the business. Sophie, a Schnauzer puppy has recently joined the team at Canterbury Clocks. She's learning the ropes and can often been seen in the window. This doggy is not for sale! Currently spends her days exploring the workshop and chewing the broom. Sadly, we regret to announce that Biscuit passed away on 16 September 2017after an illness. Biscuit was a loyal companion, customer favourite, friend and long-time feature of Canterbury Clocks. She'll certainly be missed around the workshop. Biscuit, a 14 year old Schnauzer/Spaniel cross can be found lounging around the workshop, greeting customers and always on the lookout for tidbits and snacks. Loves a pat and keeping everyone happy.